Dealing with burst pipes in winter is a hassle and expensive to fix. If you’re ready to equip your home with plumbing parts that stand up to winter, look no further than Arrowhead Brass. Arrowhead washing machine valves are made from lead-free bronze alloys for durability and safety. Certified lead-free Arrowhead plumbing parts are made to withstand unforgiving winter climates without sacrificing safety. Homeowners rely on Arrowhead frost-free hydrants to prevent damage to their plumbing when temperatures plummet. Champion Irrigation and Arrowhead Brass joined forces in 2018. With over 80 years crafting top-quality brass parts, Champion-Arrowhead combines two of the most trusted names in plumbing. Chicago Faucet Shoppe offers a wide variety of Arrowhead products and select Champion Irrigation models. Whether you’re in need of repair parts or an all-new assembly, our experts are here to help you find what you need. Genuine replacement Arrowhead Brass parts and repair kits. 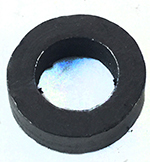 Arrowhead Brass - 3-B - Graphite Packing for Arrowhead Old-Style Packing Nut Models. Please Note: Pack of 25.